Today’s English News Lesson is about the huge, yellow duck that floated down Hong Kong’s Victoria Harbour last Thursday. Read the report, check the vocabulary, watch the video and then try to answer the simple listening exercises below. 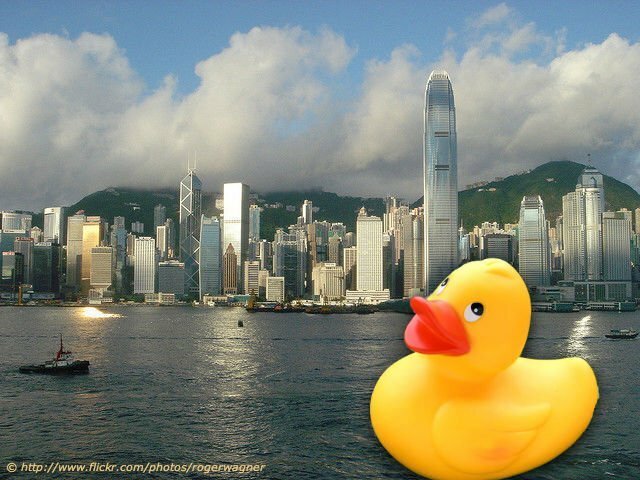 On Thursday, May 2, 2013, an enormous, inflatable rubber duck floated into Hong Kong’s famous Victoria Harbour to the delight of anticipating crowds. Inspired and created by Dutch artist Florentijn Hofman, the duck, which takes around 30 minutes to blow up, measures 16.5 metres high and 19.2 metres long. The idea behind the creation of the towering duck is to bring people together and make them more conscious about one and other and the environment. “We are living on one planet, we are one family and all the waters in the world is our global bathtub and it joins people together; it makes us family” Hofman said. The duck caused a stir among office workers who could be seen pressed up against skyscraper windows taking photos. Hofman’s aquatic creation, which has already sailed its way down Dutch, Australian and Japanese waters, as well many other parts of the world, will be on display in Hong Kong until June 9. Afterwards, the duck is heading off to the USA to an, as yet, undisclosed location. Watch and listen carefully to the You Tube video above, then fill in the missing words from the following sentences that were taken from the video report. I am thinking this must come to make my people smile in Germany too. It is being very interesting. Yes, Marcus, I wouldn’t be surprised if you don’t see it floating down The Rhine sometime soon.